In Samvat 1963 Bhadarva Vad Amas (Monday, October 7th, 1907), Jeevanpran Shree Muktajeevan Swamibapa manifested on this earth by the will of Lord Shree Swaminarayan (Shreeji-sankalp-murti). This year marks the 100th year after His manifestation, His centenary. In honor of our beloved Gurudev, Shree Swaminarayan Gadi Sansthan will be holding a Shatabdi Mahotsav in Maninagar, India and in New Jersey, USA. Shree Muktajeevan Swamibapa had a very kind, loving, and charismatic nature. By Jeevanpran Swamibapa’s darshan and contact, innumerable souls attain salvation. Even if the wind blows past Swamibapa and touches others, they become worthy of attaining salvation. Jeevanpran Swamibapa performed numerous miraculous deeds for our Sampraday. He led our faith through the so-called “modern era” and toured all over India, establishing followers and temples wherever He presided. He preached Lord Swaminarayan’s philosophy not only in India, but around the world by touring and establishing Swaminarayan Temples in Africa, the United Kingdom, Australia, and the United States of America. Jeevanpran Swamibapa was the first Swaminarayan sant to set foot outside of India, and because of Him, our Swaminarayan faith has flourished internationally. Being the first Swaminarayan sant to step foot outside of India, Muktajeevan Swamibapa was also the first Swaminarayan sant to step foot into the United States. He arrived at John F. Kennedy International Airport in New York City on October 20th, 1970. He and His eminent sants toured the entire United States from coast to coast and spread the glory of Lord Swaminarayanbapa Swamibapa to disciples all over the country. During His vicharan in the United States, Jeevanpran Swamibapa founded Shree Swaminarayan Sidhant Sajivan Mandal, USA and also established the first temple in the United States, Shree Swaminarayan Temple Seattle, a Hari mandir, in the state of Washington. Our Gurudev dreamed of building a sikhar-bandh mandir in the United States someday, and His Divine Holiness Acharya Swamishree brought this dream to reality when He performed the Murti-Pratishta Mahotsav of Shree Swaminarayan Temple Secaucus, New Jersey, Swaminarayan Gadi’s first sikhar-bandh mandir in the United States in August 2001. Upon returning to India after His international tour, Jeevanpran Swamibapa sat in continuous meditation from December 1971 through February 1972 for 61 days. Shortly after coming out of meditation, Jeevanpran Swamibapa explained that while meditating, He had received a command from Lord Shree Swaminarayan. The command was to give Shree Swaminarayan Gadi, the divine throne and abode of Lord Shree Swaminarayan, a physical embodiment. In Samvat 2028 Bhadarva Vad Amas (Saturday October 7th 1972), Jeevanpran Swamibapa’s 65th manifestation day arrived, and He gave Shree Swaminarayan Gadi a physical embodiment just as the Lord had commanded. This day was one of the most glorious days in the history of our faith. 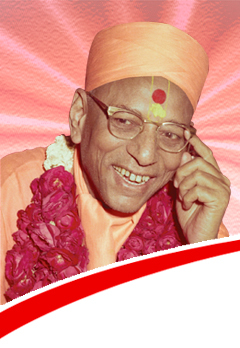 In Samvat 2035 Fagan Sud 2 (Wednesday February 28th 1979), Jeevanpran Shree Muktajeevan Swamibapa handed the helm of the entire religion to His Divine Holiness Acharya Swamishree and appointed Him to be the heir and subsequent Acharya of Shree Swaminarayan Gadi. Shortly after in Samvat 2035 Bhadarva Sud 7 (Thursday August 30th, 1979), during His third tour of the United Kingdom, Jeevanpran Swamibapa withdrew His divine darshan from this world. Our Gurudev’s final words were to His beloved heir Acharya Swamishree, “Now, I will only eat if you feed me with your own hands.” Through these words, Jeevanpran Swamibapa revealed that He gives darshan today through Acharya Swamishree. Since that day, His Divine Holiness Acharya Swamishree has lovingly further developed Jeevanpran Shree Muktajeevan Swamibapa’s legacy by continuing to tour and preach the divine teachings and supremacy of Lord Shree Swaminarayan and establishing even more followers and temples across the world.